American test pilot mission specialist astronaut 1978-1989. Died in the crash of a World-War-II-era training plane. Status: Deceased; Active 1978-1989. Born: 1939-09-07. Died: 1989-06-17. Spaceflights: 1 . Total time in space: 7.00 days. Birth Place: Portland, Oregon. PERSONAL DATA: Born September 7, 1939, in Portland, Oregon. Died June 17, 1989. He is survived by his wife, Karen, and two daughters. He enjoyed flying, auto restoration, running, and skiing. EDUCATION: Graduated from Lincoln High School, Portland, Oregon, in 1957; received a bachelor of science degree from the United States Naval Academy in 1962 and a master of science in administration from George Washington University in 1970. ORGANIZATIONS: Member, Society of Experimental Test Pilots, National Air Racing Group, Naval Reserve Association, Naval Academy Alumni Association, Association of Naval Aviators, Naval Institute, Naval Aviation Museum Foundation, Naval Order of the United States, Tailhook Association. SPECIAL HONORS: Awarded the Navy Distinguished Flying Cross, Meritorious Service Medal, 15 Air Medals, 3 Navy Commendation Medals, Navy Unit Commendation, Meritorious Unit Citation, Defense Distinguished Service Medal, National Defense Service Medal, Republic of Vietnam Campaign Medal, Vietnamese Cross of Gallantry, NASA Space Flight Medal, NASA Achievement Award, and NASA Sustained Superior Performance Award. EXPERIENCE: Mr. Griggs graduated from Annapolis in 1962 and entered pilot training shortly thereafter. In 1964, he received his Navy wings and was attached to Attack Squadron-72 flying A-4 aircraft. He completed one Mediterranean cruise and two Southeast Asia combat cruises aboard the aircraft carriers USS Independence and USS Roosevelt. Mr. Griggs entered the U.S. Naval Test Pilot School at Patuxent River, Maryland, in 1967, and upon completion of test pilot training, was assigned to the Flying Qualities and Performance Branch, Flight Test Division, where he flew various test projects on fighter and attack-type aircraft. In 1970, he resigned his regular United States Navy commission and affiliated with the Naval Air Reserve in which he currently holds the rank of Rear Admiral. As a Naval Reservist, Rear Admiral Griggs has been assigned to several fighter and attack squadrons flying A-4, A-7 and F-8 aircraft based at Naval Air Station New Orleans, LA, and Miramar, CA. His most recent assignments have been as Commanding Officer, Attack Squadron 2082, Executive Officer, Carrier Group 0282, mobilizing to Battle Force Sixth Fleet, Commanding Officer, Naval Reserve Naval Space Command 0166 stationed at the Naval Space Command Headquarters, Dahlgren, Virginia, and Commanding Officer, Office of Naval Research/Naval Research Laboratory 410, Houston, Texas. Rear Admiral Griggs current mobilization assignment is as Chief of Staff Commander Naval Air Force, United States Pacific Fleet, San Diego, California. He has logged 9,500 hours flying time -- 7,800 hours in jet aircraft -- and has flown over 45 different types of aircraft including single and multi engine prop, turbo prop and jet aircraft, helicopters, gliders, hot air balloons and the Space Shuttle. He has made over 300 carrier landings, and holds an airline transport pilot license and is a certified flight instructor. NASA EXPERIENCE: In July 1970, Mr. Griggs was employed at the Lyndon B. Johnson Space Center as a research pilot, working on various flight test and research projects in support of NASA programs. In 1974, he was assigned duties as the project pilot for the shuttle trainer aircraft and participated in the design, development, and testing of those aircraft pending their operational deployment in 1976. He was appointed Chief of the Shuttle Training Aircraft Operations Office in January 1976 with responsibility for the operational use of the shuttle trainer, and held that position until being selected as an astronaut candidate by NASA in January 1978. In August 1979, he completed a 1-year training and evaluation period and became eligible for Space Shuttle flight crew assignment. From 1979 to 1983 Mr. Griggs was involved in several Space Shuttle engineering capacities including the development and testing of the Head-Up Display (HUD) approach and landing avionics system, development of the Manned Maneuvering Unit (MMU), and the requirements definition and verification of on-orbit rendezvous and entry flight phase software and procedures. 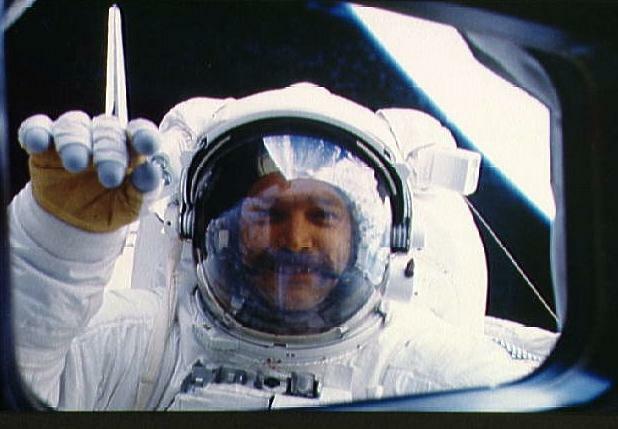 In September 1983 he began crew training as a mission specialist for flight STS 51-D, which flew April 12-19, 1985. During the flight, Mr. Griggs conducted the first unscheduled extravehicular activity (space walk) of the space program. The space walk lasted for over three hours during which preparations for a satellite rescue attempt were completed. 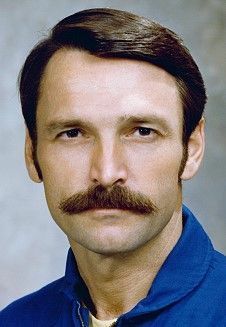 At the time of his death, Mr. Griggs was in flight crew training as pilot for STS-33, a dedicated Department of Defense mission, scheduled for launch in August 1989. He died on June 17, 1989, near Earle, Arkansas, in the crash of a vintage World War II airplane. BIRTHPLACE AND DATE: Born September 7, 1939, in Portland, Oregon. His parents, Mr. and Mrs. Jack L. Griggs, Sr., reside in Lawrence, Michigan. PHYSICAL DESCRIPTION: Brown hair; brown eyes; height: 5 feet 10 inches; weight: 175 pounds. EDUCATION: Graduated from Lincoln High School, Portland, Oregon, in 1957; received a bachelor of science degree from the United States Naval Academy in 1962, and a master of science degree in Administration from George Washington University in 1970. MARITAL STATUS: Married to the former Karen Frances Kreeb of Lake Ronkonkoma, Long Island, New York. Her parents, Mr. and Mrs. Charles Kreeb, reside in Lake Ronkonkoma, New York. CHILDREN: Alison Marie, August 21, 1971; and Carre Anne, May 14, 1974. RECREATIONAL INTERESTS: He enjoys flying, auto restoration, running, and skiing. ORGANIZATIONS: Member, Society of Experimental Test Pilots; National Air Racing Group, Reserve Officer Association, Naval Reserve Association, Naval Academy Alumni Association, Association of Naval Aviators. Naval Institute, Naval Aviation Museum Foundation, Naval Order of the United States, American Legion. SPECIAL HONORS: Awarded the Navy Distinguished Flying Cross, 15 Air Medals, 3 Navy Commendation Medals, Navy Unit Commendation, Meritorious Unit Citation, Defense Distinguished Service Medal, National Defense Service Medal, Republic of Vietnam Campaign Medal, Vietnamese Cross of Gallantry, NASA Space Flight Medal, NASA Achievement Award, and NASA Sustained Superior Performance Award. EXPERIENCE: Mr. Griggs graduated from Annapolis in 1962, and entered pilot training shortly thereafter. In 1964, he received his Navy wings and was attached to Attack Squadron-72 flying A-4 aircraft. He completed one Mediterranean cruise and two Southeast Asia combat cruises aboard the aircraft carriers USS INDEPENDENCE and USS ROOSEVELT. Mr. Griggs entered the U.S. Naval Text Pilot School at Patuxent River, Maryland, in 1967, and upon completion of test pilot training, was assigned to the Flying Qualities and Performance Branch, Flight Test Division, where he flew various test projects on fighter and attack-type aircraft. In 1970, he resigned his regular United States Navy commission and affiliated with the Naval Air Reserve in which he currently holds the rank of Rear Admiral. As a Naval Reservist, Read Admiral Griggs has been assigned to several fighter and attack squadrons flying A-4, A-7, and F-8 aircraft based at Naval Air Station New Orleans, LA, and Miramar, CA. His most recent assignments have been as Commanding Officer, Attack Squadron 2082, Executive Officer, Carrier Group 0282, mobilizing to Battle Force Sixth Fleet in the Mediterranean Sea, and Technical Advisor for Space Affairs, Office of Naval Research/Naval Research Laboratory 410. He is presently Commanding Officer, Naval Research Naval Space Command 0166 stationed at the Naval Space Command Headquarters, Dahlgren, Virginia, and Commanding Officer, Office of Naval Research/Naval Research Laboratory 410, Houston, Texas. Rear Admiral Grigg's current mobilization assignment is as Chief of Staff Commander Naval Air Force, United States Pacific Fleet, San Diego, California. He has logged 9,500 hours flying time -- 7,800 hours in jet aircraft -- and has flown over 45 different types of aircraft including single and multi-engine prop, turbo prop and jet aircraft, helicopters, gliders, hot air balloons and the Space Shuttle. He has made over 300 carrier landings, and holds an airline transport pilot license and is a certified flight instructor. NASA EXPERIENCE: Mr. Griggs has been employed at the Lyndon B. Johnson Space Center as a research pilot since July 1970, and during this time, he has worked on various flight test and research projects in support of NASA programs. In 1974, he was assigned duties as the project pilot for the Shuttle trainer aircraft and participated in the design, development, and testing of those aircraft pending their operational deployment in 1976. He was appointed Chief of the Shuttle Training Aircraft Operations Office in January 1976, with responsibility for the operational use of the Shuttle trainer, and held that position until being selected as an astronaut candidate by NASA in January 1978. In August 1979, he completed a 1-year training and evaluation period and became eligible for Space Shuttle flight crew assignment. From 1979 to 1983 Mr. Griggs was involved in several Space Shuttle engineering capacities including the development and testing of the Head-Up Display (HUD) approach and landing avionics system, development of the Manned Maneuvering Unit (MMU), and the requirements definition and verification of on-orbit rendezvous and entry flight phase software and procedures. In September 1983 he began crew training as a mission specialist for fight STS 51-D, which flew April 12-19, 1985. During the flight, Mr. Griggs conducted the first unscheduled extravehicular activity (space walk) of the space program. The space walk lasted for over 3 hours during which preparations for a satellite rescue attempt were completed. Died June 17, 1989, near Earle, Arkansas, in the crash of a World-War-II-era training plane. Family: Astronaut. Country: USA. Flights: STS-41-F, STS-51-E, STS-51-D, STS-61-K. Projects: STS. Agency: USN. Bibliography: 12, 5467. 1939 September 7 - . Birth of Stanley David Griggs - . Nation: USA. Related Persons: Griggs. American test pilot mission specialist astronaut 1978-1989. Died in the crash of a World-War-II-era training plane. 1 spaceflight, 7.0 days in space. Flew to orbit on STS-51D (1985)..
1989 June 17 - . Astronaut Stanley David Griggs dies at age of 49 -- Crash of a World-War-II-era training plane. - . Nation: USA. Related Persons: Griggs. American test pilot mission specialist astronaut 1978-1989. Died in the crash of a World-War-II-era training plane. 1 spaceflight, 7.0 days in space. Flew to orbit on STS-51D (1985)..